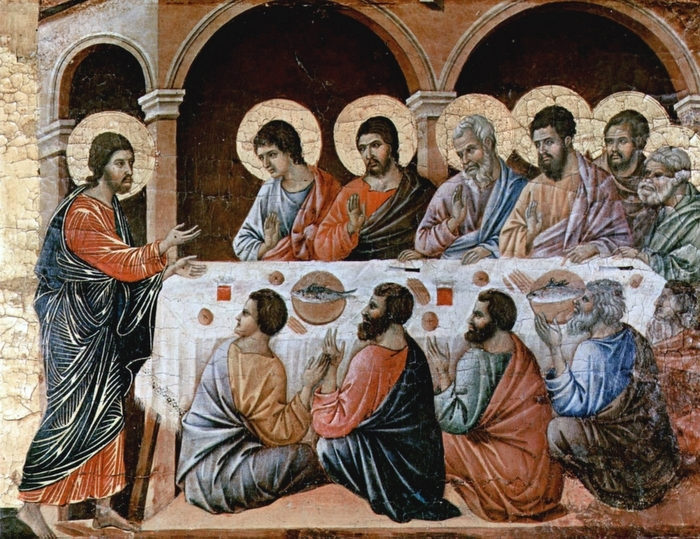 In John’s gospel, there is a long farewell discourse of Jesus to his disciples revealing many Theological truths and future events to happen in the life of Jesus and his disciples. Jesus gave them this heads up so that they might be prepared for the challenges ahead and to keep up their hope for the eternal reward. Jesus also gave them the privilege to ask anything to God the Father in the name of Jesus. He assured them that their requests in faith for the nourishment of the Kingdom of God would be granted. (John 16:16) “A little while and you will no longer see me, and again a little while later and you will see me.” (17) So some of his disciples said to one another, “What does this mean that he is saying to us, ‘A little while and you will not see me, and again a little while and you will see me,’ and ‘Because I am going to the Father’?” (18) So they said, “What is this ‘little while’ [of which he speaks]? We do not know what he means.” (19) Jesus knew that they wanted to ask him, so he said to them, “Are you discussing with one another what I said, ‘A little while and you will not see me, and again a little while and you will see me’? (20) Amen, amen, I say to you, you will weep and mourn, while the world rejoices; you will grieve, but your grief will become joy. (21) When a woman is in labor, she is in anguish because her hour has arrived; but when she has given birth to a child, she no longer remembers the pain because of her joy that a child has been born into the world. (22) So you also are now in anguish. But I will see you again, and your hearts will rejoice, and no one will take your joy away from you. (23) On that day you will not question me about anything. Amen, amen, I say to you, whatever you ask the Father in my name he will give you. (24) Until now you have not asked anything in my name; ask and you will receive, so that your joy may be complete. In his final discourse to his disciples, Jesus was mentally preparing them to face the challenges that were going to take place to him and to them. Though Jesus was ready to face the imminent passion and death, he had to prepare the disciples who were confused and might get lost in the middle of their master’s most humiliating “failure” and crucifixion. Jesus who promised crown through the cross was saying that he was going to depart from them. again a little while later and you will see me. Jesus was promising the disciples that he would return to them after his death and resurrection. However, how these were going to take place was not specified. All what the disciples could understand was that Jesus was going away from them somewhere and would return to them soon. Jesus had a clear picture of everything. We can take these reappearances of Jesus in three senses: 1. Jesus would rise from the dead on the third day and appear to his disciples who would experience the joy of his resurrection. He would continue seeing them in a supernatural way for 40 days until his ascension to heaven. 2. Jesus would send his Spirit on the day of Pentecost when they would be filled with the Holy Spirit and would experience the presence of Jesus in their lives and ministry. 3. The second coming of Christ when the disciples and all the faithful would be rewarded as promised: “in the new age, when the Son of Man is seated on his throne of glory, will yourselves sit on twelve thrones, judging the twelve tribes of Israel.” (Matthew 19:28). Within the short passage “a little while” is used seven times to give hope to the disciples. Their hearts were already filled with grief (John 16:6) because Jesus had shared his and their hardships to follow. However, they have to look from a wider view to understand the glory and joy to follow. Only Jesus had a clear picture of what was going to happen. The disciples were confused on the statements of Jesus. They were reluctant to ask him direct. If Jesus was referring to his death, they could not imagine how they would see him again. They had no clear understanding of the resurrection of Jesus. How could they ask of his death when he was only 33 years of age! Some of them discussed the issue among themselves. Jesus had mentioned before that he was going to his Father. The disciples knew that when he mentioned of his Father, he was referring to God the Father in heaven. If Jesus was going to heaven, how could they see him again? In John 16:10 Jesus had said, “because I am going to the Father and you will no longer see me.” They could not connect all these with their limited knowledge at that time. They repeated their lack of understanding on the phrase “little while” that Jesus used. When was the separation going to take place? How long would it be? They were trying to understand if any of them got the meaning of what Jesus said. (19) Jesus knew that they wanted to ask him, so he said to them, “Are you discussing with one another what I said, ‘A little while and you will not see me, and again a little while and you will see me’? Having discussed among themselves, the disciples were puzzled and where in the verge of asking to Jesus for clarification. Jesus who knew their mind took the initiative to break their curiosity mixed with fear to ask. Jesus understood that they were confused on his usage of “a little while.” He was gracious to clarify their doubt. (20) Amen, amen, I say to you, you will weep and mourn, while the world rejoices; you will grieve, but your grief will become joy. Though Amen is used at the end of a prayer, blessing, curse or statement expressing one’s endorsement of what was said, Jesus at times used it once or twice at the beginning of a statement. This was an affirmation that what followed in his statement was a solemn or important truth compared to other ordinary statements. Several factors intensified the grief of the apostles. Their weakness to be awake with Jesus at the Garden of Gethsemane after the Passover meal, betrayal of Jesus by Judas, the arrest of Jesus, the public and private questioning, the physical and mental torture, the clamor of the people for his crucifixion releasing Barabbas, his sentence to death, his humiliating journey carrying the cross to Calvary, his crucifixion and death all would add the gravity of their sorrow that would lead them to weep and mourn. Because of the fear of their own arrest, most of them were hiding. However, they would have been curiously tracking of what was happening to their divine master. Jesus made contrast of the deep grief of his disciples to the cheerfulness of his opponents and their supporters. The Jewish leaders at that time were successful in reversing the clamor of the people who sang Hosanna to the Son of David to crying to crucify him. All who demanded his crucifixion were rejoicing at his humiliating and most painful martyrdom. The high priests, the Sadducees, Pharisees, the Scribes, and the Herodians had been plotting and awaiting for that to happen. So Jesus foretold their rejoicing at the crucifixion of Jesus. That would add to the grief of the disciples of Jesus. Jesus predicted a reversal of the grief of his disciples. However, Jesus was not clarifying why they would experience such a sudden reversal. He meant that their grief would turn to joy when they would see him victoriously returning from the grave. Though Jesus had predicted his resurrection from the dead before, that was not in the mind of the disciples at that time. (21) When a woman is in labor, she is in anguish because her hour has arrived; but when she has given birth to a child, she no longer remembers the pain because of her joy that a child has been born into the world. The pain of a woman in labor is often used in the Bible to compare the suffering that would later gain victory. “As a woman about to give birth writhes and cries out in pain, so were we before you, LORD.” (Isaiah 26:17). “Before she is in labor, she gives birth; Before her pangs come upon her, she delivers a male child.” (Isaiah 66:7). The woman had been foreseeing both the hour of her anguish and its joyful outcome. Jesus was also expecting such an“hour” followed by joy for him and for his disciples. That example was giving hope to the disciples though they could not grasp the full meaning of what was going to happen. The mother ignores the pangs of child birth when she sees the child born from her. The victorious outcome helps us to forget the hardships endured to achieve it. Such would be the experience of the disciples of Jesus after their endurance of suffering that would happen in the life of Jesus and later in their own lives. The mother rejoices also because she could contribute a child to the world. The child is hers and that of the world. So also, the victory of Jesus and his disciples would be meritorious for the whole world. (22) So you also are now in anguish. But I will see you again, and your hearts will rejoice, and no one will take your joy away from you. Like the pangs of child birth, the expected suffering of Jesus and of the disciples were at hand. The suffering, death, and burial caused extreme grief for the disciples. However, that was temporary because Jesus would return on the third day by resurrection causing them to rejoice. Unlike the temporary happiness of the world, the heavenly joy of the disciples was permanent. They realized that even in their lives when they suffer and die for Christ, they also would enjoy victory in heaven. In fact, the disciples could see the Risen Lord on and off for forty days. Then he ascended into heaven to be seated at the right hand of his father. As promised, he sent the Holy Spirit to guide them and Jesus continue to lead the church as its head. Though Jesus ascended to heaven, and spiritually present among the disciples, the church is awaiting the second coming of Christ to reward his righteous for eternal joy. That would be the end of evil and suffering in this world forever. The joy of Adam and Eve in paradise was taken away by Satan by tempting them to act against the will of God. The devil and the demons continue taking away the joy of the people of God in this world by tempting them to commit sins. With the reestablishment of the Kingdom of God in its fullness at the second coming of Christ, the influence of Satan will end and the joy will return to its fullness. Satan will no longer be able to tempt the redeemed or take away their joy. (23) On that day you will not question me about anything. Amen, amen, I say to you, whatever you ask the Father in my name he will give you. During the public ministry of Jesus, the disciples had many questions. They were confused on the teachings and actions of Jesus. Even after the resurrection of Jesus, the situation did not change much. However, when they received the Holy Spirit on the day of Pentecost, all their doubts were cleared and they had no need of further questioning on the teachings of Jesus. “But when he comes, the Spirit of truth, he will guide you to all truth. He will not speak on his own, but he will speak what he hears, and will declare to you the things that are coming. He will glorify me, because he will take from what is mine and declare it to you.” (John 16:13-14). The indivisible unity of Jesus and Holy Spirit, the second and third persons of the Most Holy Trinity, is exposed here. Through the Holy Spirit, Jesus was going to reveal everything they needed to know. We see that reflected in the teachings of Peter on the day of Pentecost (Acts 2:14-41) and witnessing of St. Stephen before the Sanhedrin (Acts chapter 7). Here again, Jesus used the same phrase “Amen, amen, I say to you” to give weight to what he was going to say. The disciples were supposed to seek the Kingdom of God and ask the father the strength to continue the mission of Jesus. Then they do not have to ask for worldly things. “So do not worry and say, ‘What are we to eat?’ or ‘What are we to drink?’ or ‘What are we to wear?’ All these things the pagans seek. Your heavenly Father knows that you need them all. But seek first the kingdom [of God] and his righteousness, and all these things will be given you besides.” (Matthew 6: 31-33). Our prayers are addressed to the Father in the name of Jesus. The unity of the Father and the Son, the first and second persons of the Most Holy Trinity, is revealed here. It is the Father who grands the request of the disciple based on the exalted name of his Son. Jesus had assured his disciples that he himself will also answer their prayers when they make request in his name. “And whatever you ask in my name, I will do, so that the Father may be glorified in the Son. If you ask anything of me in my name, I will do it.” (John 14:13-14). We are eligible to seek the mediation of Jesus only if we believe him and obey his commands. Our prayers shall be in accordance with the will of God. “We have this confidence in him, that if we ask anything according to his will, he hears us. And if we know that he hears us in regard to whatever we ask, we know that what we have asked him for is ours.” (1 John 5:14-15). (24) Until now you have not asked anything in my name; ask and you will receive, so that your joy may be complete. Jesus was addressing the disciples during his last supper with them. Until that time, they had not asked anything from the Father in the name of Jesus. On the day of Pentecost when they received the Holy Spirit they began to feel the presence of Jesus within them. Then they began to pray in the name of Jesus. Will God provide everything we ask in the name of Jesus? What a disciple is supposed to ask is taken for granted. A disciple is a child of the Father and a representative of Christ. He or she is seeking the Kingdom of God as Jesus did. In the Lord’s prayer, Jesus taught us to pray, “Hallowed be thy name, thy kingdom come, thy will be done on earth.” Father cannot deny when we ask for strength and grace to endure for his kingdom. Like a parent, God will not give us anything that would be harmful to us or for his kingdom. With our limited knowledge, we do not know whether what we seek is beneficial. So, we present our needs and then submit to the will of God. so that your joy may be complete. When we seek the will of God to accomplish in our lives, it will be granted and it will provide us complete or everlasting joy. What we gain by material benefits is temporary happiness. That can be changed by time; whereas heavenly joy is perpetual and complete. Jesus instructed his disciples on how they could enjoy complete joy: “As the Father loves me, so I also love you. Remain in my love. If you keep my commandments, you will remain in my love, just as I have kept my Father’s commandments and remain in his love. ‘I have told you this so that my joy may be in you and your joy may be complete.’” (John 15:9-11). 1. Hardships in our lives, especially during the ministry of the Church, is not permanent. The Lord will give a better solution to our problems as it was the experience of the church and many of its ministers. 2. Failures in our ministry are not to be taken in a negative sense. Jesus also accepted failures, humiliation, torture and martyrdom for us. However, the victory was awaiting for Jesus and his faithful servants. So also will be our case when we follow Jesus and work according to his precepts. 3. With their limited and mundane knowledge, the disciples could not understand all the truth that Jesus shared. They got clarity only when they received the Holy Spirit on the day of Pentecost. Let us also rely on the divine revelation through the Holy Bible and teachings of the Church that are guided by the Holy Spirit. 4. Let us not be jealous on the prosperity or rejoicing of the sinners. Our goal should be far beyond the worldly happiness. There can be reversal of rejoicing at the final judgement when the Lord will come again to judge the living and the dead. 5. The agony we experience when we work for righteousness sake would be temporary and that would seem less once we receive victory with the help of the Lord. 6. The workers for the Kingdom of God have the privilege to ask anything in compliance with the will of God the Father in the name of Jesus. Since Jesus had resolved the barrier created by the original sin, we became the children of God. So, we have the freedom to ask favors from the Father who would provide everything we need because of the merits of Jesus.